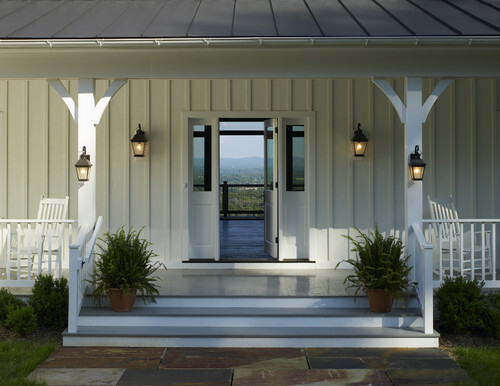 Guests won’t see any of your entry details without a front porch light. Here are seven ideas to consider when brightening your entryway. 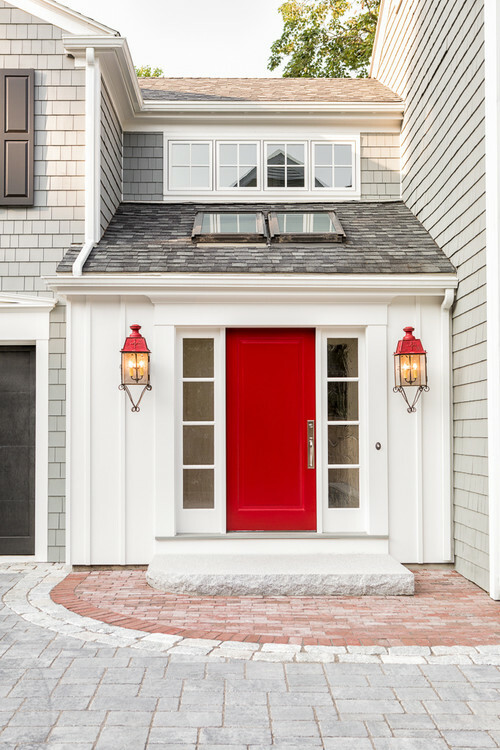 A porch light on each side of the front door illuminates the gateway to the rest of your home and creates symmetry for your home’s exterior. Sometimes it takes some searching to find the right pair of front porch lights. Linda Banks, president of Banks Design Associates, selected these antique French gaslight lanterns for her client. The homeowner, whose birthday is Valentine’s Day, loved the red color. Banks ended up using this color throughout the rest of this Portland, Maine, home. 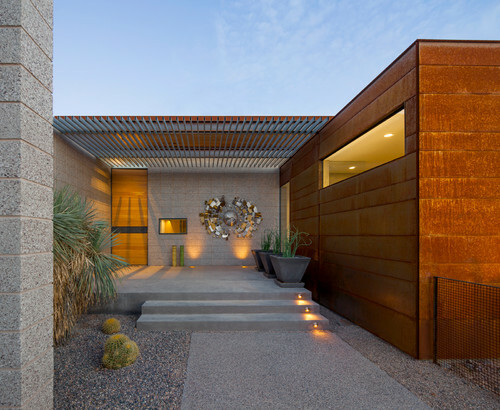 When choosing entry lights, Banks says, she and her team keep in mind the home’s environment, exterior and overall aesthetic. They also consider how much light optimally serves the space. After those factors, Banks says her first choice is always vintage lights, and she feels lucky when they find a matching pair. A few additional lights provide more front porch light and lead people right to the front door. 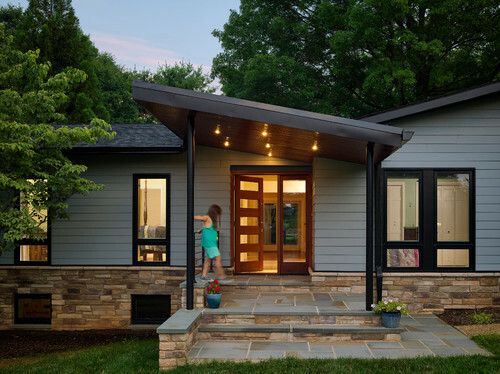 The lights on this retired couple’s home in Virginia invite guests inside to take in the views from the main living space. If you want more exterior lighting but don’t have a covered porch, consider lining the house with lights. Edward Maestri, principal and owner at Maestri, drew these exterior lights onto the architectural plans. Maestri and his team wanted lights that would complement the architecture of the home and provide the needed lighting. They decided on lights with a midcentury style that would highlight the architecture. “In this case, the lights shine both up and down, highlighting the vertical features of the facade and the architectural brackets,” Maestri says. They also liked that these lights shone up and down, minimizing glare into the yard and toward viewers. When choosing lights on your own home, Maestri recommends a light that complements the lines and scale of the home but does not compete. Lighting, he says, should be one of the final details that brings the overall style of the home together. Hanging lights make good use of the ceiling of a covered porch that wraps around a Connecticut farmhouse. 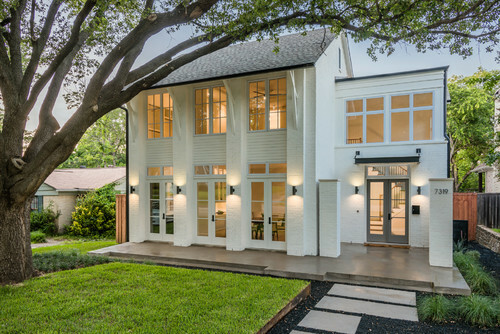 This house uses six hanging lights, plus two mounted by the front door to illuminate the long porch. Suspended from above, they provide light throughout the space, as opposed to being mounted on the side of the house. Here, lights built into the risers illuminate wide concrete steps. Uplights accentuate the art at the entry, and filtered light from above the door gives it a welcoming glow. The designer of this Baltimore-area home chose to install six recessed lights to let the roof be the dominant element. 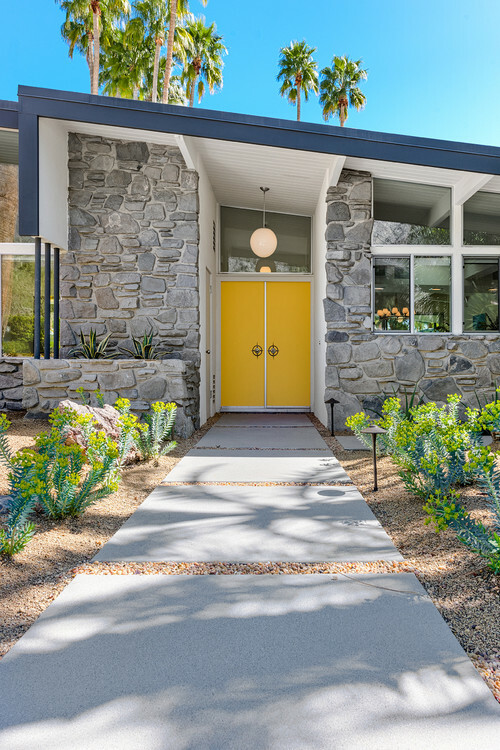 Kemper says his midcentury modern projects typically go one of two ways: Clients either choose a more contemporary look, or they stick to their home’s original midcentury vibe. These clients chose the latter and selected large globe lights for their remodel.